In 1865, President Andrew Johnson was so excited to see a game there between two of the best teams in the country that he gave his staff time off and set up chairs along the first-base side for them to watch the game. Baseball and politics entwined, for one of the first times, in 1860 when Lincoln’s election was illustrated in the news as a baseball game. The National Game. Three “Outs” And One “Run”. As Lincoln stands victorious on “Home Base,” his opponents stand watching (left to right) John Bell, of the Constitutional Union party, Democrat Stephen A. Douglas, and John C. Breckinridge, a Southern Democrat. The pollsters must have been pretty sure about things, because that 1860 illustration was published by Currier & Ives two months before Election Day. 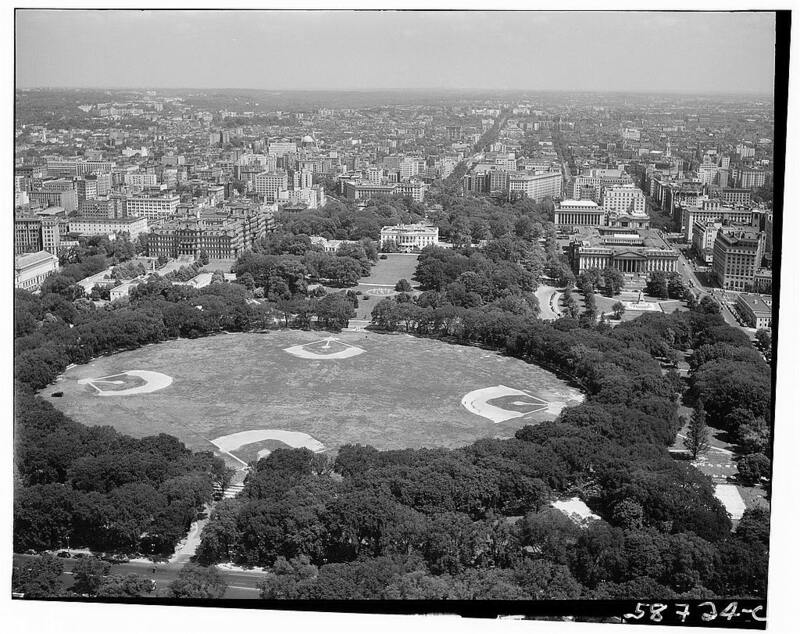 There has been baseball and, today, softball, on the Ellipse for more than 150 years. Because, baseball can’t get here fast enough. 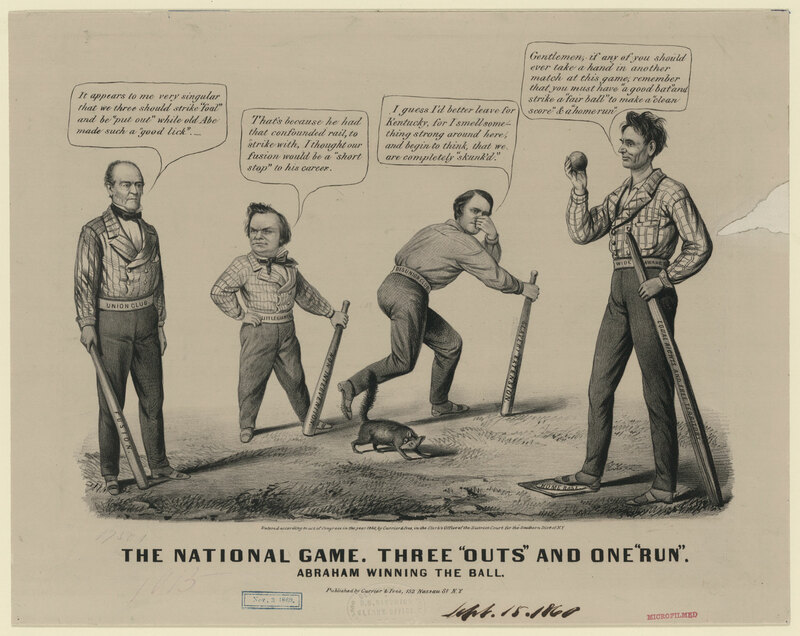 This entry was posted in Baseball, Baseball History and tagged 19th Century Baseball, Abraham Lincoln, Andrew Johnson, White House by Jackie, The Baseball Bloggess. Bookmark the permalink. I wonder if the new prez will throw out the first pitch this year. I also wonder what the reception will be if he does. I always thought that baseball didn’t become commonly known until the Civil War era. Before that the rules were so different from place to place that it was “base ball” in name only. But this 1860 cartoon suggests that it was pretty much a commonly understood game before the War. One of the books that had this cartoon said that baseball was being used back then to explain politics to its readers … so my goal is to dig up another example or two of that. Perhaps the artist was a city boy and had never seen a skunk? So, did Currier & Ives have cartoons made to cover all possible election outcomes, or were they just prescient? No … apparently Currier & Ives were confident that Lincoln would win (based on, I guess, their 1860 version of blog pundits, online pollsters, and television “talking heads” who were, in this case, much smarter than today’s) so that was the editorial illustration they issued. That skunk bothers me. Maybe that’s how skunks looked 150-odd years ago. Maybe skunks are just cuter today! Today is Oriole’s Fan Fest in Baltimore and tonight is the UVA baseball event and dinner. (Ozzie Smith is the guest at the UVA event!) Unfortunately, Randy is still housebound with his broken hip, so we’ll be sitting at home this Saturday thinking about all the baseball fun everyone else is having without us … including you! I’m a most unhappy camper, but I hope you enjoy your Reds Caravan day! 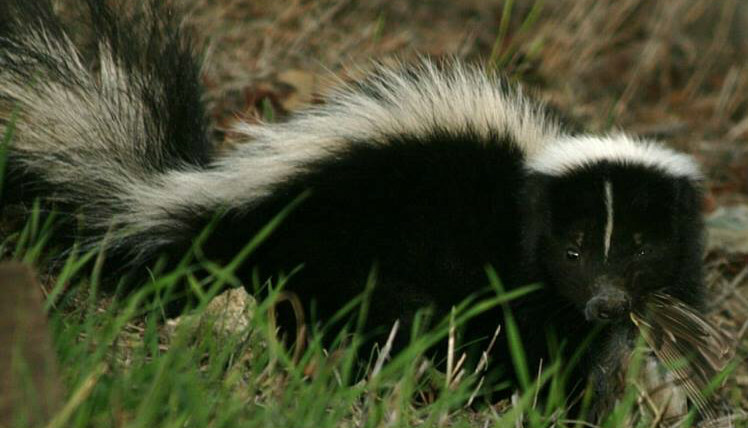 That “skunk” gave me pause too – I thought, what the bejesus is that? I’m with you, I’d take our adorable little two-tone guys over that thing any day. This post is like a bellows to the embers of my baseball spirit – the season can’t get here fast enough. Happy 16 days till pitchers and catchers report! And I love your Valentine’s post script. Oh, and the rest of the post too! This is great. With all the negative things we’re hearing about the White House, it’s nice to see someone bring a baseball-related topic to light. Can you imagine if they still played baseball this close to the White House? Maybe more people would find enjoyment and be able to relax and hangout together over a great ball game and some popcorn instead of arguing over politics! Thanks, Ashley. I think that they still play softball (and ultimate Frisbee) on some parts of the Ellipse, and nearby, in the summer … so maybe there’s hope! When I lived in DC I was always pleased to see Members of Congress come together to play on the congressional softball teams each summer. Clearly we need some more of that! Oh! I guess that would be a pretty good landing strip for a spaceship. I’ve never seen the movie, but having now watched the trailer (which I’m posting here, just because it’s fun), I think it’s now on my you-oughta-see-this-movie list. And, I’ll look for the White Lot. Thanks for the trivia!